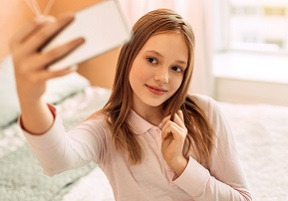 When it comes to the effects of social media on our tween and teen nieces and nephews, a new study by researchers at the University of Essex and UCL published at BMC Public Health finds a gender difference. Girls who engage in social media at age 10 are more likely than boys to have reduced well-being into later adolescence. By age 13, about half of girls are engaged in social media for more than an hour per day, while only about a third of boys are. And by age 15, both while both genders increase their interactions on social media, more girls are (59%) than boys (46%) are spending an hour or more on social media. The researchers caution that the associations between social media and well-being may have been underestimated. The study used self-reported data on school days, not the weekend when tweens and teens often have more time for social media use. Researcher Dr. Cara Booker advises to “monitor early interactions with social media, particularly in girls, as this could have an impact on well-being later in adolescence and perhaps throughout adulthood."